David Millar won the final stage time-trial at the Critérium International to make it a super Sunday for Britain. The Garmin-Transitions rider was fastest on the technical 7.7-kilometre course around Porto-Vecchio, beating Alberto Contador (Astana) and Michael Rogers (HTC-Columbia). 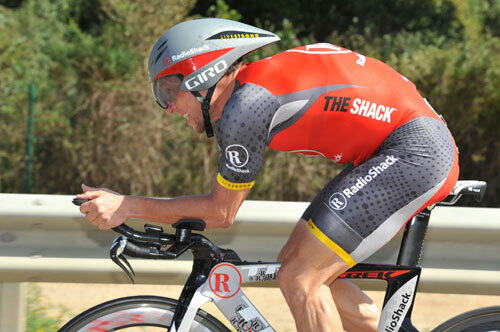 Meanwhile, yesterday’s stage winner Pierrick Fedrigo (BBox Bouygues Telecom) rode a strong time-trial – finishing fifteenth, just ahead of Lance Armstrong (RadioShack) – to clinch overall victory. Behind, Australian Rogers edged out Tiago Machado (RadioShack) for second place. Millar’s first win of the year comes just hours after Team Sky rider and compatriot Russell Downing crossed the line first in the race’s morning road stage, making it a Sunday to savour for Britons. The result also moved the 33-year-old up to fifth overall. “I’m over the moon. With Russell’s win, it’s a great day for British cycling. That was a wonderful win for him, I think we can be very proud,” Millar said. Dutchman Lieuwe Westra’s early mark was bettered by Alberto Contador. For twenty minutes, it looked like the recent Paris-Nice winner would take victory before Millar took the fastest time by two seconds. He flies to Belgium tonight, hoping to build on his good form and condition by challenging for the Three Days of De Panne which starts on Tuesday. “Anything can happen at any time in De Panne; there can be a break in the peloton or god knows what. We have a very strong team there, and they’ll be very motivated to help me out. Hopefully I’ll have a good couple of weeks now,” he said.